Campanelli is clearly a brilliant researcher with a knack for building complex and cascading arguments. He wears cynicism well and the many rebuttals to bland technocratic optimism nested throughout the book are articulate, entertaining and purposefully employed in the construction of larger arguments. An example: early on Campanelli qualifies discourse on the web as "autistic, self-referential and monolingual" and—drawing on the thought of Italian philosopher Mario Perniola—paints a lucid picture of how present times are considerably less discursive than we might like to believe. These threads later resurface in a pivotal discussion that describes the paradox of 'experiencing' the web as being similar to glancing at ephemeral snapshots of complex data flows. His glib prognosis of agency on the web: "But since the Web is already everything before any action of mine, I no longer interact, I only jump from one flow to the other." While it is easy to single out some of the more bombastic statements in the text, it should be duly noted that Campanelli consistently leverages the overarching tensions he identifies to conduct rigorous investigations of various aesthetic concerns including the divide between optical and haptic modes of production and consumption, a survey of encoding and 'lossy' media compression, a discussion about memes and an examination of ethics and intellectual property after remix culture. The section on 'fictions' is particularly brilliant and it fuses an analysis of seminal sci-fi film and literature, Apple's 1984 Super Bowl advertisement, the separation of form and content on the web and network cartography into a valiant meditation on the impossibility of representing the internet. Despite the flashes of genius like the one described above, Web Aesthetics is a wildly uneven text. The meticulously constructed arguments packed into the first half of the book are a slog to work through, or at the very least 'inside baseball' for those already well-versed in the history of aesthetics. In all fairness, one can't help but wonder the degree to which this griping results from the translation of the original text from Italian to English and subsequent editing. 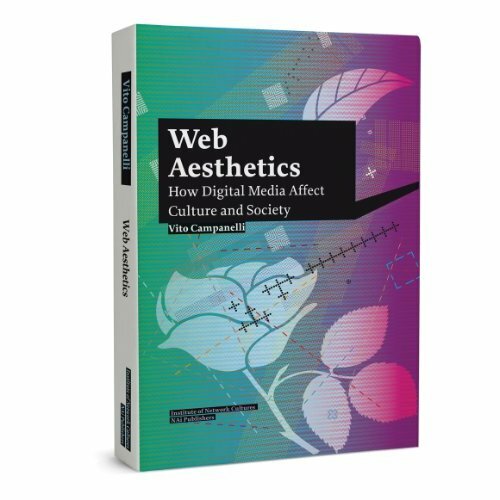 Campanelli's writing is most engaging when he's juggling contemporary paradigms, discussing specific instances of mediated experience and deftly capitalizing on his encyclopedic knowledge of media art and film. There are moments during the latter half of Web Aesthetics that would benefit from being less tethered to Lev Manovich's work, but, despite this concern, Campanelli has competently synthesized the scholarship of Manovich and numerous related figures (Geert Lovink, Alan Liu, Lawrence Lessig, Eduardo Navas, etc.) into a text that is nimble enough to effortlessly transition from dissecting Rosalind Krauss's analysis of the grid and the avant-garde to addressing King Tubby and versions in dub music. Although maddening at times, one can't walk away from Web Aesthetics without a renewed appreciation for how the 'digital everyday' shapes and sculpts our perception. Campanelli's interrogation of form is dizzying in both scope and ambition and this work provides a provocative overview of the contemporary media landscape. Greg J. Smith is a Toronto-based designer with interests in media theory and digital culture. He is a managing editor of the digital arts publication Vague Terrain and blogs at Serial Consign.